If you grew up in the eighties, and you were dance mad, then the 1985 movie version of A Chorus Line may well have been one of your favourite movies and the inspiration for dreams of a dancers’ life. Certainly that’s the case for me. The original production of A Chorus Line premiered in 1975 and became, at the time, the longest running musical on Broadway, winning not only a string of Tony Awards, but also prestigious awards for drama. 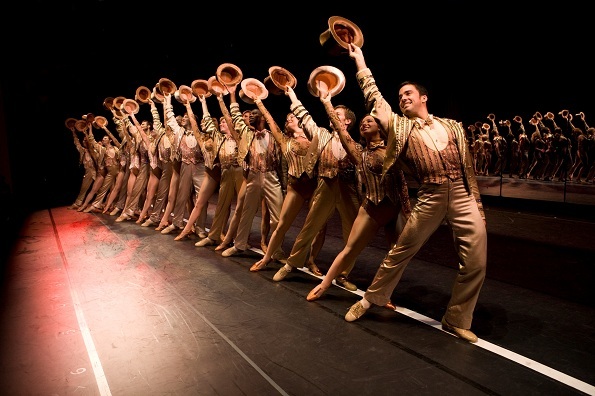 A Chorus Line was a new breed of musical with a back story that could stand alone – not merely a prop for the musical numbers – though these are outstanding also. Any new production of this landmark musical has a lot to live up to, but also much material for the foundation of a great piece of theatre. 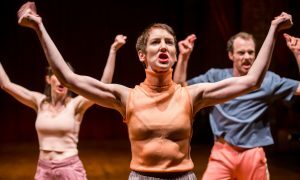 The new production at the Adelaide Festival Centre produced by Tim Lawson and TML Enterprises certainly delivered. As the lights went up and the show began, the scripted dialogue and American accents gave me concern that this would be a mere imitation. But once my ear adjusted to the accents, I realised the performance by most of the cast had real depth, and at times, a quirky humour. Some of the characters were particularly likeable – particularly Debora Krizak as Sheila, Ashley McKenzie as Bobby, Hayley Winch as Val and Rohan Browne as Greg. ‘At The Ballet’ sung by the characters of Sheila, Bebe and Maggie was incredibly moving. Karlee Misipeka’s interpretation of ‘Nothing’ by Diana, epitomised the character’s frustration and feelings of isolation, while also entertaining us with hilarious anecdotes and an inspirational determination to succeed. But the best thing about ‘Nothing’ was Misipeka’s vocals. ‘Stunning’ is the word I think best describes her voice, or perhaps ‘angelic’. In fact, it is the singing in this production of A Chorus Line that is the show’s greatest strength, particularly the voices of Misipeka, Krizak, Monique Sallé (Bebe) and Stephanie Grigg (Maggie). There were a couple of scenes that were a little disappointing. Euan Doidge’s performance of Paul San Marco, revealing painful experiences from his youth, did not move me as it should have. And the potentially exuberant number ‘I Can Do That’ by Mike (performed by James Maxfield) did not quite hit the mark, although this is more due to the choreography than the performance. At the end of the number we had a glimpse of Maxfield’s acrobatic ability, but it would have been great to see more spectacular tricks throughout the piece. The staging was done well. For example, the contrast between the bright lights when the dancers were standing on the line and the tableaus of dancers during the montages was very effective. Unfortunately, the costuming was somewhat disappointing. It was appropriate, yet not flattering – which is at odds with the idea of dancers trying to look their best for an audition in order to get the part. It would also have been wonderful to see the potential of the dancers more in the choreography. For example, ‘The Music and the Mirror’, performed by Anita Louise Combe as Cassie, gave the dancer very little opportunity to sparkle. For most of the number I thought perhaps Combe was more a singer than a dancer, but when she got to the end and started to move, it was clear she was absolutely a dancer. But still, she looked restrained, as if the choreography didn’t provide the opportunity for her to fully extend herself. The bottom line … should you see this production of A Chorus Line? Absolutely! It is a classic, a landmark musical, and worth seeing. It is well produced and well performed. Entertaining. Engaging. Moving. Inspirational. Bring it to Sydney please Mr Producer !!!!! 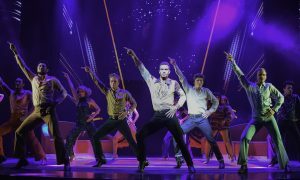 Very disappointed in A Chorus Line Melbourne, lack of emotions, costumes terrible, dancing needed more pazaz, agree with Joanne MacDonalds review, We both expected more.. Lack lustre presentation. Totally agree the Melbourne production is very over-rated. Glimpses of good dancing but not great. Characters don’t extend much past the talking about dancing. Characters are trying for a show with dancing right…so they need to dance. Was disappointed but maybe with shows like think you can dance we expect too much? ?